Welcome to Casa del Mar - A stunning 4 bedroomed villa which sleeps 8 people and has fabulous views overlooking the Mediterranean sea. 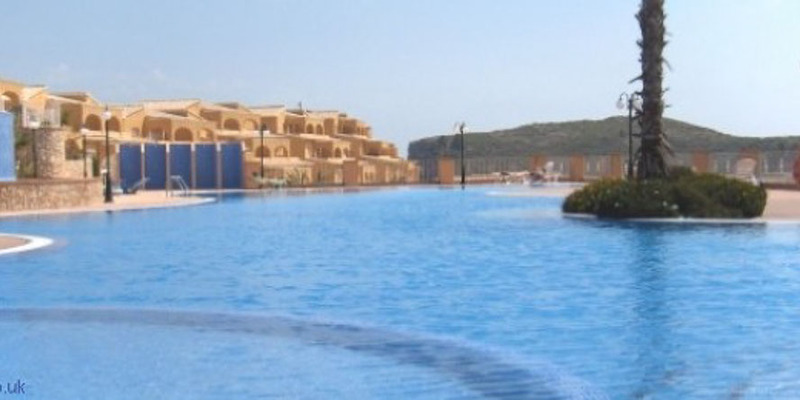 Located on the eastern tip of Spain in Cumbre Del Sol close to Alicante. Our guests are the first to greet the sun every morning as it rises majestically over the calm waters of the Mediterranean Sea. This is a beautifully part renovated home on a 900m2 plot, build size of approx.146 m2 with 60 m2 of patios. The villa is laid out over two floors and is entered on the ground floor: which leads to a large dining table for up to 10 people. Lovely fireplace with glass hatch and heater fan. Satellite TV, flat screen 49". Air conditioning. Exit to the south facing terrace with new comfortable furniture. Open kitchen with dishwasher, four ceramic glass hob hotplates, microwave, freezer, electric coffee machine, toaster etc. New bathroom / WC with walk-in shower and floor heating. There is a staircase to the lower ground floor with panoramic window. On this level there are two double bedrooms, each with double beds, air conditioning and wardrobes. The master bedroom has a double four-poster bed, satellite TV, flat screen, WC with walk-in double shower, floor heating, washing machine and air conditioning. Exit to terrace. The 4th double bedroom has a double bed, flat screen TV (Spanish channels) and dresser. WC with shower through hallway. Outside is the south facing terrace furnished with sunbeds, new dining furniture for eight people and a new barbeque. The terrace offers marvellous panoramic views over the sea and pool area. On a sunny day you can see Ibiza on the horizon. The swimming pool is heated (4 x 8 meter) with cover and outdoor shower. With the nearest beach located 2.5km and the coastal reseorts of Javea and Moraira at approx 12km Casa Del Mar makes for a perfect holiday. This cozy townhouse on the outskirts of Moraira and consists of 2 bedrooms and 1 bathroom. From the terrace you will fall in love with the view and especially the sunset. The perfect place for the evening dinner. You enter the townhouse via some stairs onto the terrace. From the terrace you enter the living dining area. From here you can enter the twin bedroom with two single beds. On the other side is the master bedroom and the family bathroom. All windows have mosquiito nets. The living room and the master bedroom have air conditioning. The living room also has a fan, WIFI-Internet, UK TV and a range of DVDs for you to enjoy. The sofa opens up into antoher double bed making the property suitable for up to 6 guests. The kitchen has all the necessary utilities, dishwasher, electric hob and oven, kettle, coffee maker, toaster, orange juicer, fridge-freezer and microwave. The townhouse has a dedicated parking spot below the terrace and a locker room with the washing machine. 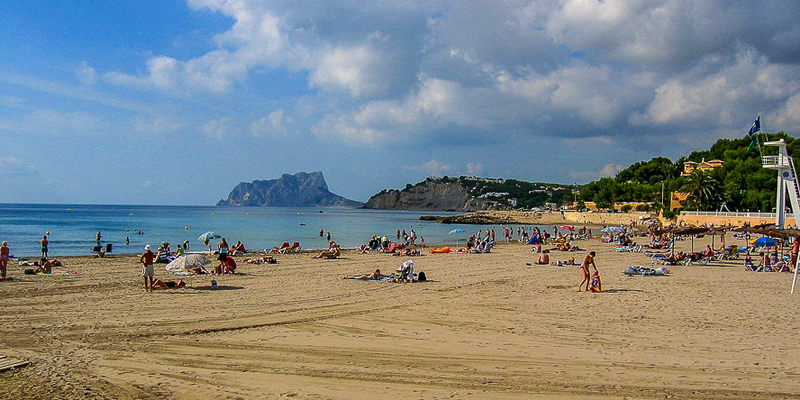 Located only 1.8km from Moraira town center and the beach. A beautiful location for your holiday. Entry into the house is via a gated private garden and down 5 steps to the front door. The front door leads into a hallway and straight into the open plan living / dining space. The kitchen is off the lounge and is equipped with, fridge / freezer, dish washer and full oven. Doors lead out onto a terrace (naya), with a table and chairs for six to dine al fresco. From here there are even better valley views. Off the dining room is the master bedroom with a large en-suite bathroom (with bath and shower), king size bed, fitted wardrobes and air conditioning. Leading off from the hallwayy there are two further double bedrooms. All three bedrooms have air conditioning, pull down shutters and built in wardrobes. There is a separate family shower room shared by these two double bedrooms. The pool area has exterior lighting so can be enjoyed in the evenings . The gardens are well maintained and the views are wonderful. A charming house, tastefully furnished with a fantastic swimming pool , privacy and wonderful views. Just a short drive from Moraira and a little further from Javea. This lovely house is the lower dwelling of three linked properties, it has private terrace with stunning views across the bernia mountains . The house benefits from air conditioning in both bedrooms and the lounge. patio doors leading to a furnished private terrace for ál fresco’ dining. full size bunks. The house and area is ideal for a wonderful relaxing holiday in a truly unique location. Location, Location, Location! 2 bedrooms / 1 bathrooms (sleeps 4 + 1 infant on request), air-conditioned, sea-front apartment (with lift access) on the pedestrianised Moraira Promenade, and the best position in town! Situated just 50 metres from the Mediterranean Sea, a 2 minute stroll to the beautiful sandy beach, and adjacent to restaurants & all amenities, the apartment occupies an exceptional and sought-after south-facing location with stunning views over the sea and picturesque marina. Relax on the superb private terrace, which captures the sun all day long, and enjoy amazing sunsets over the sea with a glass of local champagne. 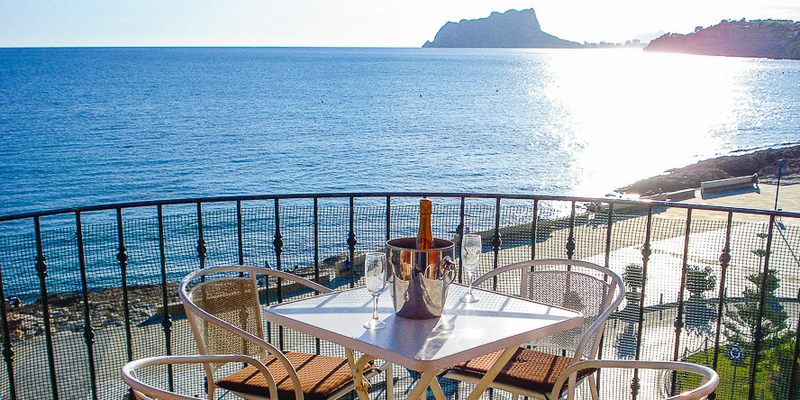 The fantastic views encompass the marina, the Rock of Ifach rising from the sea, Moraira Castle, and distant mountains. Step out of the door at street level and straight into any number of first class restaurants & bars offering all kinds of international cuisines, as well as traditional Spanish, which will suit all tastes & budgets. The marina, a supermarket, bank, and many interesting and trendy shops are no more than a minute's walk. Boat trips along the coast & a variety of water sports (e.g. scuba diving, snorkelling, and jet-skis) are readily available. WI-FI is available in a cafe just 4 doors along from the apartment building. Check your emails whilst enjoying breakfast or a drink in the sun! In the evenings, take a stroll around the pretty, narrow streets and soak up the relaxed village atmosphere, have a delightful meal in one of the many restaurants, or simply watch the world go by from the privacy of your terrace. The apartment offers a complete holiday experience, as a car is not necessary to enjoy everything that the up-market town of Moraira has to offer, and its elevated position also provides perfect tranquility. The town is vibrant and colourful without being noisy, and the bars & restaurants are lively but low-key. If you wish to dispense with a car altogether, there is a pre-bookable shuttle bus service that runs from Alicante to Moraira. If you've been to Moraira before, you will appreciate that this apartment occupies a rare and very privileged position. If you haven't yet experienced this beautiful, exclusive town - we're sure you'll be among the many that return year after year. The property is ideal for those who appreciate wonderful views and the convenience of the beach and all facilities close by, and also for couples (both young and not-so-young) as it provides a romantic setting. For those considering a winter sun break, the apartment offers a very sunny haven, and has hot/cold air-conditioning for cooler days. BRIGHT LIVING/DINING ROOM: Decorated in contemporary style with comfortable sofa, and dining table & chairs. There is hot/cold air conditioning unit. The door leads onto the private terrace and the fabulous views, and the window at the far end of the living/dining room overlooks the marina. KITCHEN: Open-plan to the living/dining room and includes a dishwasher, oven & hob, washing machine, microwave and fridge/freezer. The living/dining room has a door opening onto the private terrace and the fabulous views over the sea, the Rock of Ifach, Moraira marina, and distant mountains. Undoubtedly, the most privileged spot in Moraira. South-facing, the terrace enjoys the sun all day long and, as the day draws to a close, you can enjoy spectacular sunsets over the sea. The apartment is situated in a pedestrian area on the 3rd floor, with a secured main entrance and lift access. FREE 24 hour parking is available close by (5 mins walk), and it is possible to drop off passengers and luggage adjacent to the apartment building. TWO BEDROOMS: Both with double beds, wardrobe/storage space, and fans. The master bedroom has lovely views from the windows. Cot can be provided to accommodate an infant on request. BATHROOM 1: Large walk-in shower, basin & WC. Location, Location, Location! 3 bedrooms / 2 bathrooms (sleeps 6 + 1 infant on request), top floor, air-conditioned, sea-front apartment (with lift access) on the pedestrianised Moraira Promenade, and the best position in town! Relax on the superb private corner terrace, which captures the sun all day long, and enjoy amazing sunsets over the sea with a glass of local champagne. 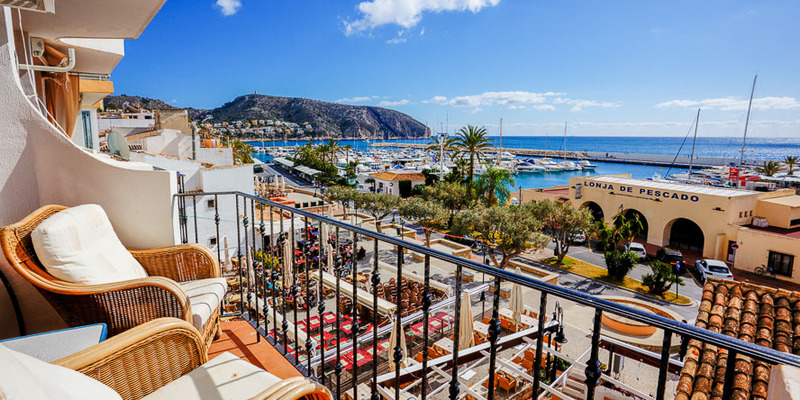 The fantastic 180 degree views encompass the marina, the Rock of Ifach rising from the sea, Moraira Castle, and distant mountains. The property is ideal for families or groups of friends who appreciate wonderful views and the convenience of the beach and all facilities close by, and also for couples (both young and not-so-young) as it provides a romantic setting. For those considering a winter sun break, the apartment offers a very sunny haven, and has hot/cold air-conditioning plus electric radiators for cooler days. We are happy to accept bookings for part-weeks (subject to a minimum of 7 days), the extra days being charged pro-rata, and arrival/departure days are flexible. BRIGHT LIVING/DINING ROOM: Decorated in contemporary style with comfortable sofas, and dining table & chairs. Satellite TV including some UK channels, DVD and CD players. There is also a single fold-up sofa bed (in addition to the sofas) that is suitable for an extra person. Hot/cold air conditioning unit. There are double doors leading onto the private terrace and the fabulous views, and the window at the far end of the living/dining room overlooks the marina. The living/dining room has double doors opening onto the private, semi-circular corner dining terrace and the fabulous 180 degree views over the sea, the Rock of Ifach, Moraira marina, and distant mountains. Undoubtedly, the most privileged spot in Moraira. South-facing, the terrace enjoys the sun all day long and, as the day draws to a close, you can enjoy spectacular sunsets over the sea whilst enjoying a pre-dinner drink or dining al-fresco. The apartment is situated in a pedestrian area on the top (4th) floor, with a secured main entrance and lift access. THREE BEDROOMS: All with double beds, wardrobe/storage space, and large fans. In addition, there is a hot/cold air-conditioning unit in the hallway which provides extra cooling/heating for the bedrooms. All the bedrooms have lovely views from the windows. BATHROOM 2: Shower enclosure, basin & WC. Apart from the hot/cold air-conditioning units, there are also portable electric radiators for cooler days.